It’s been a long time since I’ve had another cake! This month however I have QUITE a few. It’s insane. I told my Husband August was the last month I’d make cakes before the baby came and it just filled up! Why can’t every month be this full and fun? Anyway this cake was for a sweet little birthday girl whose favorite song is “I love to see the Temple”, a song LDS children frequently sing at church. To make it I covered a cake with fondant. 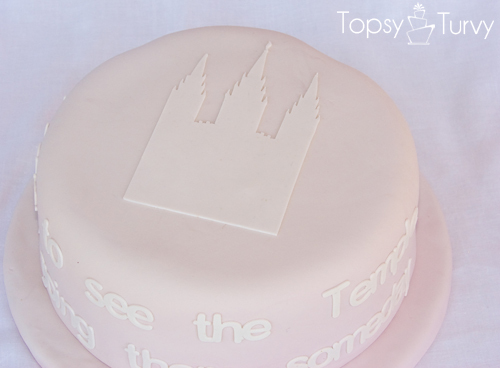 Then I used my silhouette to cut out the fondant words of the song as well as a silhouette of the most famous, local, Temple, the Salt Lake City Temple, in white. 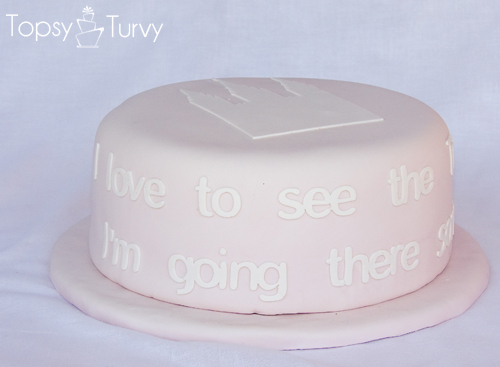 If your interested in cutting this cake out with your silhouette here is my studio file for I love to see the Temple. I used my pasta roller to roll the fondant to a number 3, about the thickness of a dime. For my machine settings I used the special blade from desert designs, cut speed 5, thickness 25 and choose the pink cap (even though I was using my special blade). Ashlee, this is gorgeous! How fun for a sweet little girl’s baptism or birthday!! LOVE IT!! Thanks Amy! I’m really happy with how well it turned out, and it would work for any temple silhouette too! Thought of Mandy when I was making it actually! Such a pretty cake! I love that song. Thanks! I’m so happy with how it turned out! I hope the birthday girl liked it! That cake is so pretty. We were singing that song all last week during our Utah Temple Tour. My kids love it! I bet you sang it quite a few times last week! 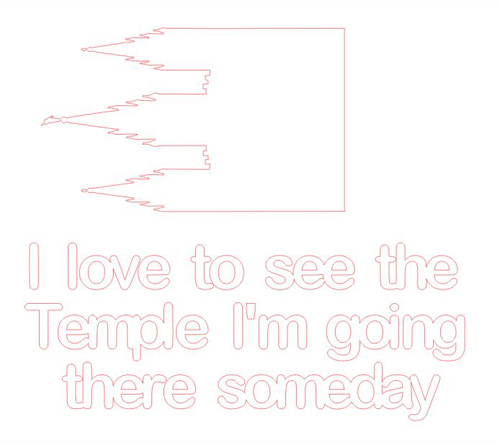 I guess we could cut out small versions of each temple you went too and made cupcakes! I LOVE this one. So Simple, but really stunning! thanks Kristy! I can think of a few songs this could work really well for, with various silhouettes! A blossoming tree branch on top with popcorn popping around the sides! I didn’t know that such a blade existed! Must save pennies for one! Thanks Kendra! Can’t wait to see how your latest party went! You used your silhouette to cut out the temple and words? You are a ROCKSTAR!!!!! Does Silhouette know you can use the machine for that? You should write them and get some free products for being so smart! That cake is stunning! AND Yeah for a pick-up in cake orders!!!! Can’t wait to see that baby! They do know that she sells this blade, From what I’ve been told they are working on getting FDA approval to use the sillhouette with food products, but until they do they can not support the use of it with food products. But at least they don’t have to ask me to stop! People were using the cricut for fondant cutting for quite a while before the cricut cake came out. I wouldn’t mind when they did get the approval if they wanted to work with me though 😉 but for now I’m on my own! Beautiful, as always! So simple, clean, and perfect. Thanks Hollie! It turned out nice, I’m happy with it! Gorgeous!! It is such a pretty cake:-) So simple and elegant! Gives me a great idea for a YW activity! Thanks for sharing your wonderful talent! Thank you so much, your not the first person to say that! I think your right, it would make for a good cake for a YW activity! This is awesome! I didn’t know it was possible to use a silhouette for cake stuff! Thank you so much! I’m still learning and playing with it, but so far a really fun project! Thank you so much! I’m not sure what they sang, as it was for a client and I wasn’t there when they busted out in song! I love your cake. I am the baker in are house too. I have some angry bird cupcakes to make tomorrow in fact. I just found your wonderful blog and wanted to invite you to my weekly any link goes party at Bacon Time. I am even giving away a cute pair of fork silver earrings to one lucky linker this weekend. Hope you will join us. Thanks so much for the invitation! Your fork earrings are SO cute! As well as some of the other stuff from your shop, I like the bird cage’s as well! I can’t wait to see how your angry bird cupcakes turn out!